One of the most important things homeowners need to know is how to shut off the water supply to the entire home and also to each individual fixture. Making sure each person who lives in your home understands how to do this simple task can help avoid costly water damage in the event of a leak or line break. The first shut-off valve is typically located where the water line comes in to the house, usually in the basement or crawl space on an outside wall near the front of the house. It may also be near the water heater or in the garage if the home is built on a slab. This shutoff valve can usually be turned off by hand. Just turn the valve handle clockwise to turn off all water to the house. The second shut-off valve is at the water meter itself. Shutting it off requires a special key or a pair of channel locks. There may also be a third shut-off valve located in a box buried in the ground in front of the water meter, which is usually on the edge of your property near the street. If there is a leak on the water line outside your home, you may have to shut the water off at this location. Sometimes you can turn this valve off by hand, but you might need that special “key” or a pair of channel locks to turn it off. 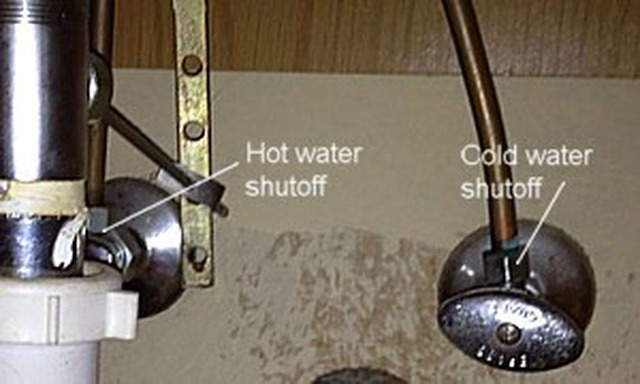 If you don’t know where your shut-off valve is, or you don’t have the right tool handy, call your local water department or contact My Georgia Plumber to shut your water off for you. In the event of a leak at a single fixture, each fixture in your home has an individual shut-off for each of the hot and cold water lines. When the main water line enters your home, it then branches off to smaller lines to each fixture in your home. Each of these individual supply lines should have its own shut-off valve, also called a stop. Homeowners should become familiar with the location of each of the shut-off valves so that in the event of a leak or fixture failure, the water supply can be cut off quickly, drastically reducing the amount water damage that can occur. In addition to checking your waterlines, each individual stop should also be check at least once a year. Each valve should open and close easily. This will also help prevent them from sticking when you need to use them in the event of a leak. If you find that one of the valves is sticking or leaking, call us to replace it right away. Ready to schedule an appointment? Service can be requested by calling our office at (770) 592-0081. You may also request a call back via internet request or schedule service directly online 24 hours a day 7 days a week.